Friday, December 12, 6-9 p.m. The Process of Abstraction, a solo exhibition of new work by JT Thompson, opens at CS Gallery on December 8. 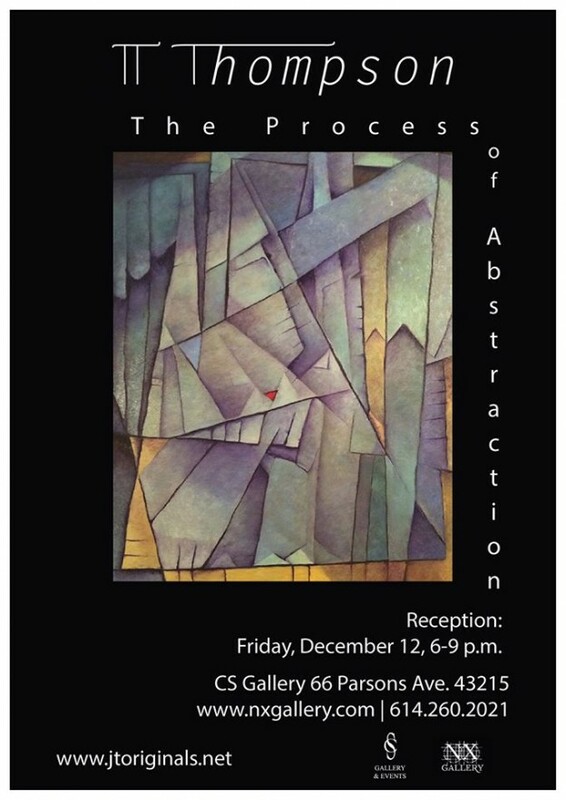 Please join us on Friday, December 12 from 6-9 p.m., for the artist reception and to meet the artist. The exhibition presents a new series of artworks exploring a style he calls Geometric Surrealism. This style explores the use of multiple sources of light as an aid in creating spatial depth in abstract compositions. Light reflecting and refracting off of multiple geometric planes guides the viewer’s eye, and gives shape to what might otherwise be a chaotic mass of line and color. In this process the work he produces is dynamically bold, stimulating and mysterious. The images capture the viewer and entice the eye to explore the composition. Thompson’s work is inspired by the tension between certain dualities: the conscious and subconscious, good and evil, light and dark. As an abstract artist he is philosophically interested in the subjectivity of the mind, and it’s capacity for skewing perspectives of external events or the physical world. JT Thompson is a Columbus-based artist, working primarily in oils. He is the co-founder of Underground64 Studios, a shared artist studio space and classroom facility. Thompson’s work can be found in the collections of the Columbus Museum of Art, the Downtown Hilton (Columbus, OH), Northern Kentucky University(Highland Heights, Kentucky, and private collectors.